Remember the way your PC performed when you booted it up for the first time? It was so fast that if you blinked, you missed the Windows logo. Programs installed in minutes. From hitting the power button to having an open document took mere moments. You could run multiple programs with no impact on your PC’s performance. It was lightning quick and powerful. Float like a butterfly, sting like a bee. Your PC was the heavyweight champion of the world. Now think about your PC as it is today. Is it a lean, mean, lightning machine? Or is your windows computer on the couch, eating chips, sighing loudly when you ask it to do things? If the second characteristic sounds familiar, there are ways to get your computer off the couch and back to top performance. 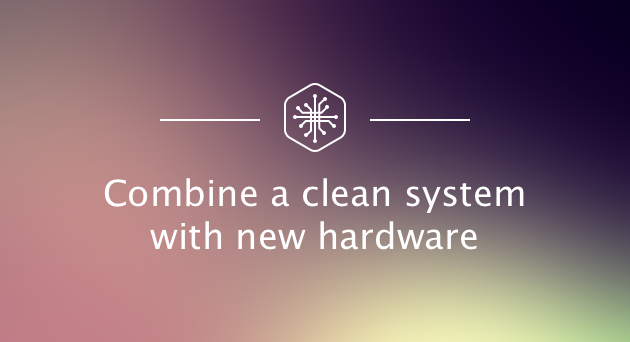 You can either invest in hardware or make your PC perform faster with software. We’re going to start with software upgrade advice. If you’re only interested in hardware solutions, you can go to the section Add some hardware muscle. Have you ever seen a muscle-bound weightlifter run or try and perform exercise that require agility? It’s not a pretty sight. Power is great for your PC system but there’s an even easier (and more cost effective) way to improve your performance - optimizing it. That’s right, before you address hardware solutions to improve your PC performance, you should first look at the system you have, to make it a lean and agile machine. Junk files, a cluttered Windows registry, and traces of the programs you’ve installed over the months and years are the lead shoes weighing your computer down. Adding new hardware to a system that is bogged down is like adding a new engine to a car that has never had a service and also has a flat tire. So let’s clean up your PC and really get it back into shape. Junk files are the temporary files that (ironically) permanently take up space on your system and slow it down. Sort of like extra pounds of fat. 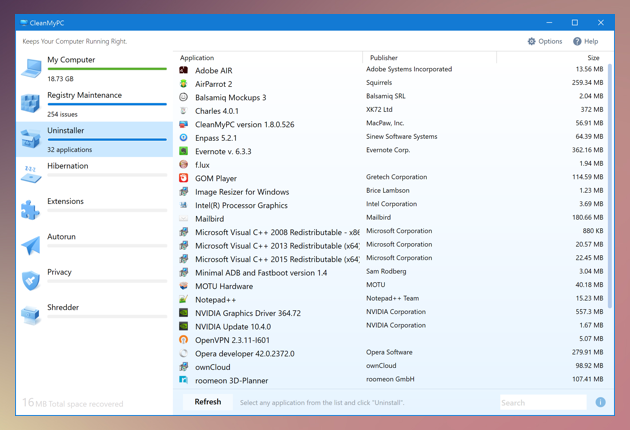 You can manually search for these junk files but we’d recommend playing it safe by using the Windows Disk Cleanup utility. 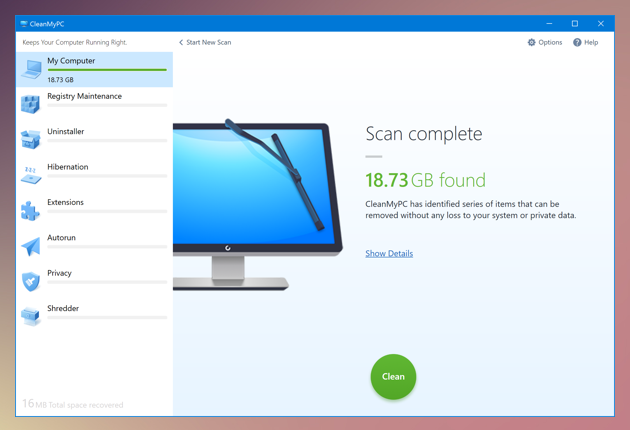 Click Start, and in the search box type “Disk Cleanup” Open the app and select the drive that you would like to clean Temporary data is broken down into groups for you to choose what to remove Another option is CleanMyPC, a specialist Windows cleaning and optimizing app. It’s even more thorough and easy to use than Disk Cleanup. If only a workout at the gym was as easy as that! Your PC could be as fast as you like, but if you have a whole bunch of programs sucking away all your resources, there’s not going to be much left for what you want to do. The simple solution is to find and remove the programs you don’t need. CleanMyPC again provides an even easier way to solve these problems. It’s like a Swiss army knife of cleaning apps - it has a fix for just about every common PC slowing problem. The Uninstaller section will not only easily remove your old programs, it will make sure that no junk files are left behind. Something the Windows uninstaller can’t do. The Startup Cleaner section is where you can turn on and off startup programs. You can’t go wrong because if you change your mind you can just turn a program back on. Now we’re really starting to get lean and mean. If you’re going to get more up to date hardware, it makes sense to make sure your software is similarly up to date. The latest updates for Windows, drivers and your essential programs will work together to optimize your system processes. Even the tiniest update can contain important optimizations that will dramatically improve your PC’s performance. This is especially true for graphics card drivers. The game you used to play on “ultra” graphics settings that you now have to play on “medium” to get it to run properly? Updated drivers on a clean system can get you back to high quality settings and smooth gameplay. Having an up to date anti-virus program isn’t just about security. Virus, malware and adware will also use up your system resources, making Windows slow to a crawl. Make sure your security programs are set to update automatically, are turned on for live protection and are set to scan your system on a regular basis. Who doesn’t fantasize about adding extra power to their systems? If you’re on a budget then you need to prioritize what upgrades are right for your system. We’re going to help you to identify the different upgrade paths you could take, so that you make the right hardware upgrade for your specific needs. More space – the more free space your PC has, the faster it runs. That free space is not just an empty vacuum waiting to be filled with failblog videos or all six seasons of Game of Thrones in HD. Your PC uses free space for vital operations all the time. Better space – upgrading to a solid state drive (SSD) improves the way your PC accesses data, making it so much faster. In terms of the biggest performance boost, a SSD as your startup disk is the choice to make. Installing RAM is one of the easier hardware additions. The most important consideration is whether you need to add more RAM in the first place. It’s not always a case of more RAM leading to better performance. If you’re playing games or video editing, you will need 8 GB of ram, with 16 GB plenty to see you through. For basic home or office use, 4 GB should be plenty. If you’re looking at near term upgrades, bear in mind that DDR4 RAM has begun to replace DDR3 RAM on the market. For this reason it’s good to make compatibility with DDR4 something to think about when you upgrade your hardware. Whether you’ve known it from looking at the specs, or installed a program that doesn’t run properly, it’s a sad moment when you realize that your graphics card isn’t up to standard. It’s time for an upgrade. While the performances of integrated graphics cards on some systems have been slowly improving, nothing beats a dedicated graphics card, especially a good one, for the most instantaneous and most spectacular performance boost. Just make sure your new card will fit in your system and your current power supply has enough juice to power your new graphics beast. The Heart and Soul of your PC, and like a heart transplant, you shouldn’t do one unless the upgrade is a significant improvement. If your CPU is fairly new, there’s not much of a performance boost from upgrading to a new one. However, if you are going to upgrade, make sure that the CPU upgrade is compatible with your motherboard. From fallen hero to superstar reborn. From underestimated to overpowering. From underdog to top dog. If you’ve followed all these steps, you’ve built a monstrously quick and powerful PC. No longer slow and sluggish, your PC can now beat you in a footrace up the steps of any landmark you care to mention. Just don’t forget to perform regular software maintenance, like with CleanMyPC, so that your PC will remain clean, fit and off the couch.